I strongly recommend you visit Chabana of Yoron. While many places fall short of expectations, here is what you expected. People are also kind and comfortable. The entrance water way is very narrow with a chain of rocks. it the angle to Chabana guide light at 27 02.8N 128 24.6E. I made a phone call to the sightseeing section of Yoron town office. 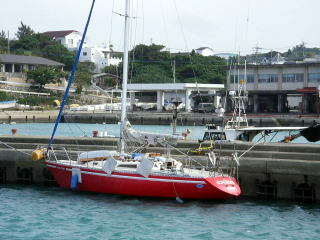 Ikeda-san, who happened to be a yacht man, came to me on a motor boat and guided me to the port. you will see the first big green buoy on your left; and then the second green buoy on your left. which landmark is a white square building. 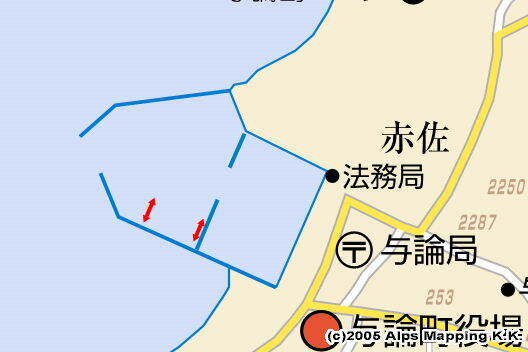 Berth: The first outer side port and the second inner side port are separated by breakwaters. You may moor the boat alongside at the middle of a breakwater in the first port. It is the visitor berth authorized by the town and the fisheries cooperative. You could also moor bow-to at empty spaces in the first port. The second inner side port is just for fishing boats. As the town is large enough, you can buy anything at large A-COOP supermarket and others nearby. There are also many restaurants. Water is available at a tap on the quay in front of you. Toilet with western styles is at the nearest park. Coin laundry is next to A-COOP supermarket a few minutes away. Fuel: There are two gas stands near the post office 10 minutes away. A bathhouse is available for JPY 500 at the inn “Nankaiso”, which was intorduced by Ikeda-san.